Shaping up while deployed isn’t easy, but with a little creativity and a do-it-anywhere program, it’s far from impossible. This is your field guide to fat loss while you’re touring overseas. I hate to break it to you, but you're not going to achieve three percent body fat while sleeping under a High Mobility Multipurpose Wheeled Vehicle. Don't plan on cutting until you get back to the rear. The best you can reasonably hope to do is maintain what you have. Above all else, stay hydrated! Since many fat-loss routines still include some strength training, feel free to borrow some exercises from the previous list. To tailor them for your purposes, set up a circuit and mix in some sprints. Boulder throws are not challenging enough? Have a race with your buddies, or a farthest-throw contest. Grab a 30-pound ammo can in each hand and have a foot race (see Marine Corps CFT for examples). Does your vehicle have a spare tire? Flip it a few times, or have a tire-rolling race. You can even use a full backpack for 1- and 2-handed exercises. Begin by standing in front of a boulder that you can lift with moderate effort. Keep a negative arch in your back, heave it up like a power clean. From the squatting position, drive it upward with your legs, shoulders and arms and throw it forward as if you were shooting a basketball. Run up to it and repeat. Ten of these repetitions make one set; rest one minute and repeat three more sets. For an added challenge, clearly mark the starting and ending locations of the boulder on your first set and try to cover the same distance for each subsequent set. Begin by filling two ammo cans with sand and lock the lids on. With a negative arch in the back, bend at the waist and grab a can in each hand. Perform 10 "dumbbell" rows and then sprint 30 yards with a can still in each hand. Drop one and perform 20 "can presses" (use two hands to press the can overhead). Pick up the dropped can and sprint back to the starting point, holding a can in each hand. Drop the cans and perform 20 push-ups. That's one set. Rest two minutes and repeat. For an added challenge, time yourself and don't slow down for more than five seconds on each set. Start by tying a rope or cargo strap to a large tire and ensure the strap is long enough to allow you to drag the tire. Put the rope around your waist so you can run and drag the tire. Drag it forward 40 yards, then slip out of the rope. Face the tire, grab the rope and run backward, dragging the tire with your hands for 20 yards. Drop the rope and flip the tire the final 10 yards to the finish line. That's one set! Rest for two minutes, repeat the sequence back to the starting line. For an added challenge, have a buddy sit in the tire and get a ride for the dragging portions. Don't let yourself slow down for more than 10 seconds on each set. Gather a group of 10 full sandbags and stack them in a loose pile. Stand with your right foot just in front of the pile. Keep a negative arch in your back, use both hands to grab a bag, and in a single motion, rotate your torso and fling the bag to your left. Repeat for the remaining nine bags. Quickly gather them into a pile and repeat the process; fling them back to the right. That's one set! Rest one minute and repeat for three more sets. Gather a group of 10 full sandbags, and stack them in a loose pile. Stand directly in front of the pile, bend at the waist with a good negative arch. Grab a bag by the top with your left hand and use a "lawnmower-starting" motion to throw it behind you as far as possible. Quickly repeat for the remaining bags. Gather them up into a pile and repeat the process with your right hand. That's one set! Rest two minutes and repeat for three more sets. You'll need a buddy about the same size as you. Hoist him up in a fireman carry and run 100 yards. Let him down, and it's his turn to carry you 100 yards. That's one set, and there's no rest between sets. 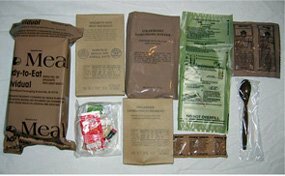 You can't eat the entire MRE if you want to lose weight. Go ahead and swap those fruit-flavored candies for some cheese spread or mixed nuts. You'll need to be very careful about spacing your mini-meals throughout the day. If you're lucky enough to receive mail, ask your friends and family to send healthy snacks such as beef jerky, granola bars, protein bars, dried fruit and nuts. As when bulking, supplements can be incredibly helpful for a fat-loss regimen, and there are plenty of low-carb, diet-friendly options like protein, protein bars, meal replacement powders, and other healthy snacks. Here's a sample daily meal plan using 2 MRE's per day (about 2000 calories), skipping the dessert. I generically label each MRE as A or B to avoid confusion with the multiple meals/snacks you'll be eating. If you're lucky enough to trade your dessert for a more nutritious snack, feel free to consume it whenever you need a pick-me-up.